Foreign Minister sent letter to AU Chief | .:TesfaNews:. 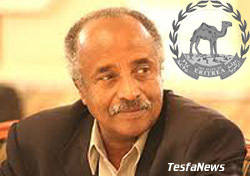 The Eritrean Foreign Ministry on its October 18 letter sent to the chairperson of the African Union Commission, H.E. Dr. Jean Ping, urged Ethiopia from continuously violating IGAD’s rules and procedures. The letter also urges Ethiopia to respect Eritrea’s right of participation in any IGAD lead or sponsored meetings in the future.